New year, new leaf. As the new year begins, it's a time for reflection on the lessons from the past year. And also a time for us to start new with resolutions for the new year. But how to make them count? Here are 8 ideas for resolutions and strategies to make them actionable. At the end of each year, set aside some time to reflect on how it went. It may have been an amazing year or a completely horrible one. What went well and what didn't? What would you like to change about the year? Find an hour of time and just start writing! Here's a year end reflection template with a list of 18 prompts to get you started. Discuss your reflection with a close friend or family member. A Harvard study that is almost 80 years old found that our relationships and how happy we are in our relationships has a powerful influence on our health. For many however, relationships fall into the category of "important but not urgent," pushed aside for other more pressing and time-sensitive matters. 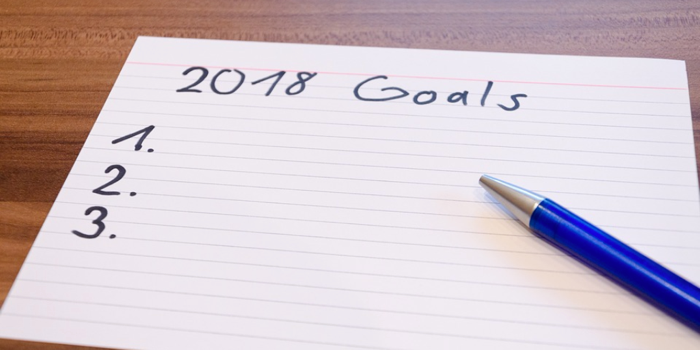 The New Year is a great time to reflect on how well you're balancing relationship goals against personal and career goals, and consider making changes. Make a list of friends based on whatever criteria you want: friends who inspire you, colleagues you want to get closer with, or long-lost friends who have dropped out of touch. Set a goal to reach out to them and schedule time to catch up. Difficult as it may be to find time in the day, meditation has been shown to reduce stress, foster clear thinking, and increase our capacity for empathy and compassion. While meditation often conjures images of pretzel-like twisted yogic positions or cave retreats, there are many far simpler and more accessible ways to incorporate meditation into your daily life. Give an app a try. Both Headspace and Insight Timer are both examples of apps which provided free guided meditations. Here's a list of far more. Try a meditation retreat. By committing time to a more structured activity, you're more likely to get immersed in it.. The resolution to read more books is a super popular New Year’s resolution -- for example, even Mark Zuckerberg -- and it's right up there in popularity with exercise and getting organized. Decide on a goal for how many books you want to read, and think about how to incorporate it into your schedule. For example, Audible books are a great way to listen to books and incorporate it into your commute. Whether your hobbies are current or aspirational, taking action to deepen your exploration of them can be a really meaningful experience. What's an area that you've always wanted to spend time in? From painting, photography, playing cards -- to music, extreme sports or motorcycles, the first step is to just get started. Sign up for a class or meetup. Yelp or your local community center is a great resource to find local classes. Remember that convenient locations are important to building habits that stick, find something that's near to your home or work. Pick a new hobby and try it at home. Lots of free resources are available, from Make: for crafting or YouTube to learn all kinds of new skills. Escaping to the beach, mountains or even just a stroll through the neighborhood helps both your body and your brain. It kills multiple birds with one stone, from exploring a new place to enjoying the outdoors to getting a great workout in. Do it with a buddy. This is a great way to kill two birds with one stone, if you have a resolution around building healthier relationships. Rather than meeting up over a drink, do it outside! Make a bucket list of places you'd like to visit outside. Sometimes there are undiscovered gems just in your backyard. Healthy eating is not about strict diet rules or depriving yourself of foods you love. Rather, it's about finding an array of foods that you like and are healthy, and then building a set of habits around them. The payoff of eating healthfulness is feeling great, having more energy, improving your health, and stabilizing your mood. Try meal planning. Consider how much time you have, and browse and pick menus based on what you have available. Here's a list of meal planning apps to help you out. Try a meal delivery service like Blue Apron or Hello Fresh. Having a box shipped to your door with all the ingredients can make it easy to choose to eat in rather than go out. Set a goal to eat more meals at home, because research suggests that meals prepared at home tend to be healther. Whether you realize it or not, most of us spend the majority of our days doing things that we've largely done before. It's not often that we experience brand new things, but what if you set a goal to do exactly that? Studies suggest we fear an unknown outcome more than we do a known bad one. However, it's an opportunity for self-discovery and growth. "New" can fall into all different categories of things, from learning a new skill like juggling or cooking or a pottery to trying a brand new activity you've done done before like a new restaurant, yoga, a different brand. Make a New Years Resolution around a list of things you'd like to try. Ask a friend to keep you accountable - make a pact that they can pick something new and you'll say yes. Break your routine by changing an aspect of your daily routine -- like what you eat, what you're doing for exercise, or what you're doing for fun. Just to try something different! A new year is a fresh start, like a blank book where you can write whatever you'd like into it. Hopefully some of these ideas and actionable areas spark inspiration as you focus on crafting and keeping smart goals. What do you want your story to say? May 2018 be your best year ever.